The musical heritage of Covington, as it developed over 129 years ago, was influenced by many factors, not the least of which were the musical preferences of the crowds of hundreds of summer visitors who came over from New Orleans. 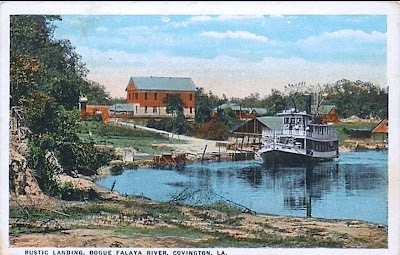 Boats from New Orleans would come up the Bogue Falaya River and tie up at Columbia Landing. Only the smaller boats could make it as far as Columbia Landing, however, the steamer Camilia would tie up at Old Landing. 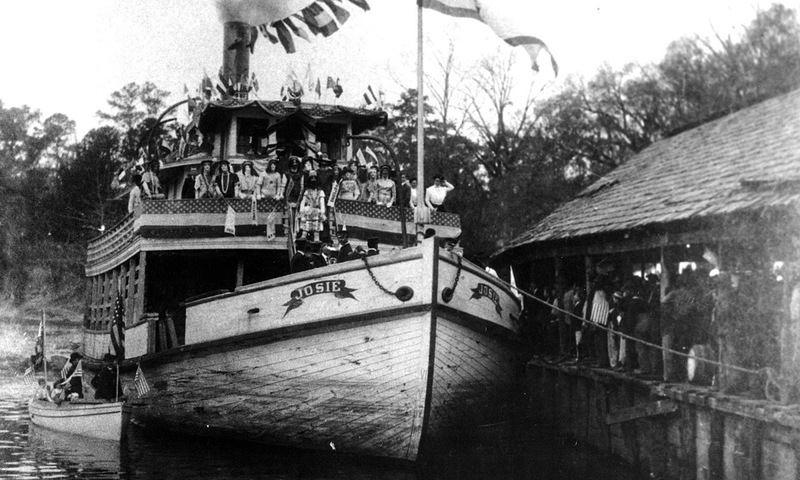 Thousands of visitors would arrive by boat, and often the bands from New Orleans would play on the boat, and then disembark and play at Covington area venues. 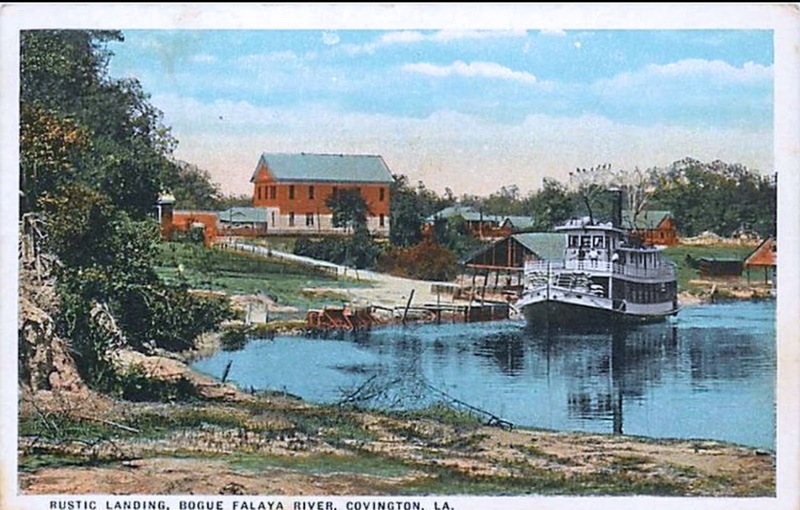 Excursion boats from New Orleans to Covington usually ran on Sundays, with many of the passengers spending the night at the Southern Hotel and enjoying the ballroom and parlor where they could dance until it was time to go back across the lake. In a book written in the mid-1980's, Dr. Karl Koenig outlined the musical heritage of towns around Lake Pontchartrain. He noted that "social affairs were first limited to small soirees and outdoor activities, such as picnics, swims and hayrides. The dances were more of family/friend gatherings than commercial endeavors, with the music furnished by small local groups or solo pianists." According to an article in the January 4, 1897, issue of the Farmer, a social 'hop' took place at the residence of Mr. J. C. Barelli, and it featured a few waltzes and reels, and 3 or 4 "tuckers" The younger folks liked to dance and were "still tripping the light fantastic" late into the night. Dr. Koenig noted that as far back as 1879, steamers were crossing the lake from West End and other southern locations on Lake Pontchartrain bringing excursionists to the North Shore. 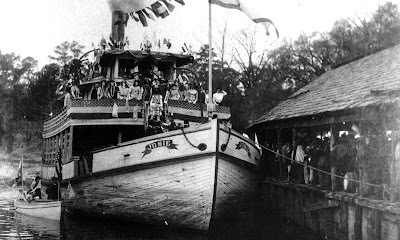 "At this time there were at least six large steamers cruising the lake, bringing as many as two thousand people on the weekends," he stated in his book. 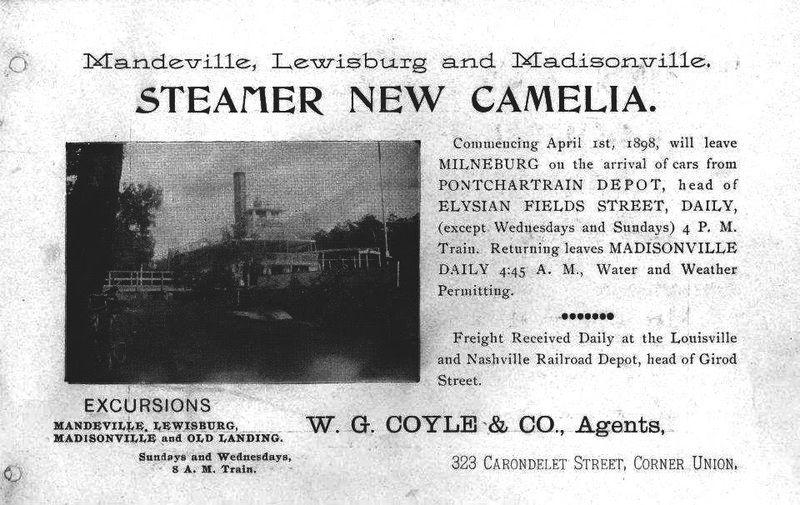 According to a Farmer article dated July 5, 1879, "Next Sunday six steamers will cross the lake with excursions for Mandeville, Madisonville and Covington, being the New Camelia, Abita, Alice, Georgia Muncy, Heroine and Henry Wright - thought that these steamers will bring over no less than 2000 persons." 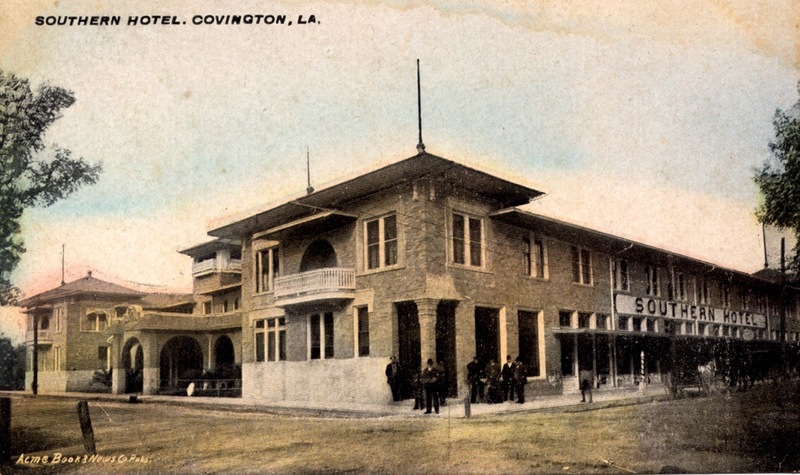 Mardi Gras was grandly celebrated in Covington from the very early days, and music always accompanied the parades, the balls, and whatever other gaily-attended event was on the Carnival schedule. In 1880, the paper reported that a Grand carnival procession to the courthouse was held where a grand masquerade and fancy dress ball was given in honor of the occasion. The music for the carnival ball was supplied by the Johnson family band that rode on the plantation tableau float. The Farmer's article about the event said that the fireman's ball continued all night, with people dancing until the sun came up. Dr. Koenig explained that during this era, bands that played for dancing were usually called 'string bands' and varied in size from two to five or six musicians. The larger brass bands would play for the larger dances and affairs that could afford them, such affairs usually were held in larger halls or outdoors. The Farmer often mentioned various affairs using smaller string bands. 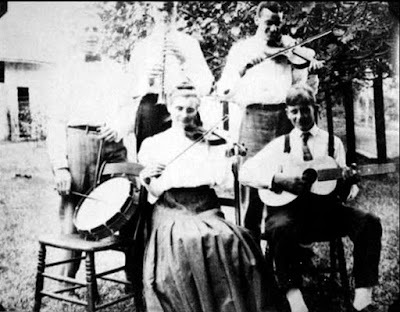 Music troupes would even be hired to play for dances held in connection with the launching of ships built in Madisonville, and there were quite a few of those launchings back in those days. 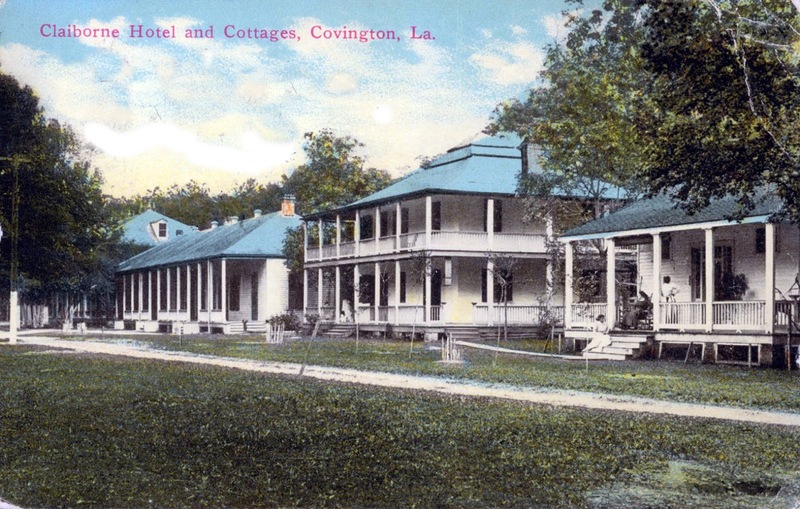 "Besides the lakeside hotels in Mandeville and the local downtown hotels in Covington, there were resorts scattered in the nearby countryside. One such place was the Blueberry Grove Hotel, set in a scenic grove close enough to Covington to enable free transportation from Covington," he said. "Train excursions were as popular and as much used as the steamers on the lake. Another popular place for social gatherings was the Claiborne Hotel in Covington. Most of the hotels used their dining rooms after dinner for dancing. It was a picturesque atmosphere, right out of the 'Gay Nineties.' 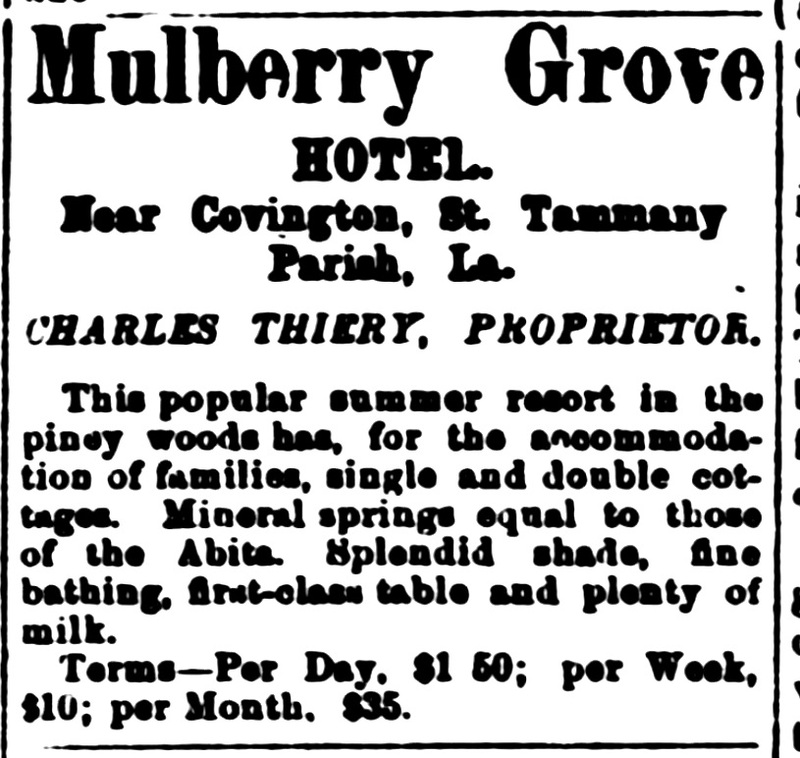 Here is a description: "Claiborne Hotel - Sweet strains of music floated out from the large dining hall, summoning the numerous couples of promenades. " Bands and orchestras featured elegant names. 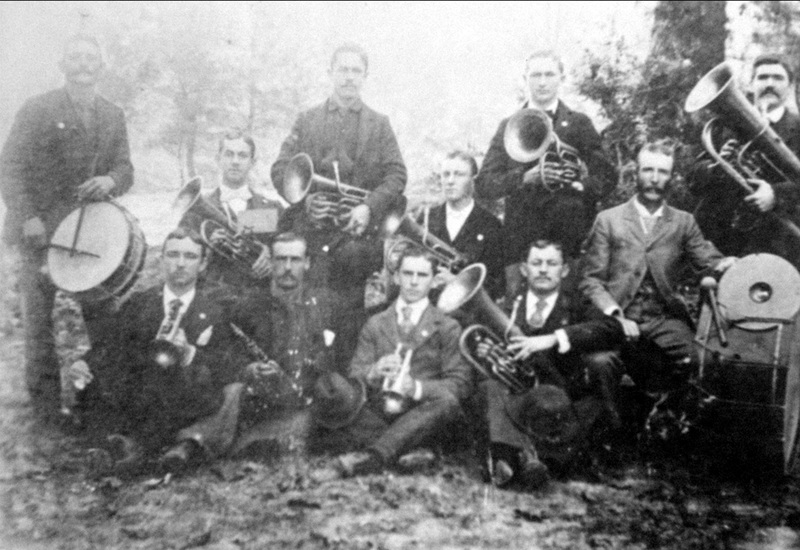 One group calling itself the Orpheon Francais Orchestra presented a concert in Covington on September 13, 1890, with the purpose of raising funds to build a new Catholic Church in Covington. The program included both vocal and instrumental music by "some of the most talented amateurs" in the parish. "The present church edifice is in a very dilapidated condition and beyond repair, and the ladies have concluded that the time has come to build a new one, in order to keep pace with the spirit of improvement visible on all sides," according to the current St. Tammany Farmer article. 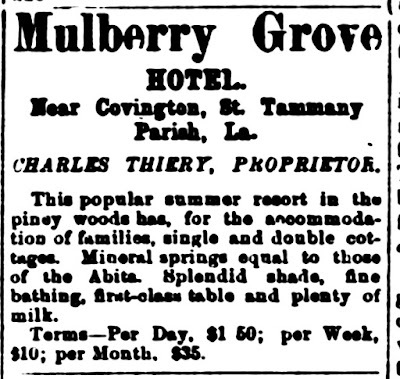 Dr. Koenig found repeated notices of "social entertainment" throughout the year 1890, both at private homes ( such as the Bossier House) and the commercial hotels (such as the Frappart and Crescent Hotels), as well as the excursion boats (such as the New Camelia.) A number of dance halls and outdoor pavilions were the scene of dances, also, such as Paul's Exchange. The "Can't Get Away Club of Mandeville gave its grand annual ball at residence of Mr. Robert Cooper, according to a February 8, 1890, article, and the ""Washington Artillery is coming to Mandeville and will be accompanied by a brass band," reported another article in August of that same year. Dr. Koenig explained that the town was in need of a large hall for community activities as well as government business. The answer was to build a new Town Hall that was completed and dedicated on August 25, 1890. An account of this evening, a typical evening of this era, included the stylist entertainments of the late 19th Century in a small town of Louisiana. This entertainment and dance that followed would be the setting for the evolution of the new ragtime craze and the soon to follow "jazz age" dances. Approximately $500 was raised in the event that was billed as an Oration, Festival and Ball. The newspaper said that the date of August 25, 1890, "will forever hold a bright and prominent place in the history of Covington, for on that night our new and handsome Town Hall building was dedicated to the uses of the public. This event had been looked forward to with fond anticipation by young and old, and its occurrence fully came up to their brightest expectations. Shortly after the doors were opened the auditorium began to fill up, and soon the hundreds of seats were occupied. " Mayor Guyol introduced attorney Chas. B. Stafford of New Orleans, who proceeded to deliver a "most eloquent and interesting address, referring to the past history, present prosperous condition, and bright future in store for our beautiful little town. He proved himself an orator of considerable ability, and was listened to throughout with marked attention. He paid a fitting tribute to our charming town and parish, fine scenery, healthy climate and energetic and hospitable people, and complimented our honorable Mayor and Alderman for having succeeded in erecting such a handsome edifice, which he predicted would mark a new era of prosperity for our town and parish," the news item recounted. Music followed the oration, of course, and included a piano solo, fancy dance, a solo performance, a "Japanese dance and tableau (in costume), another solo (with chorus), a "comic dance," another piano solo, a tableau depicting "Pygmalion and Galatea," orchestra music, another tableau (this one called "Faith, Hope and Charity"), and a final number by the orchestra called "Home Sweet Home." With a program like that, one can see that early Covington did indeed enjoy memorable singing, music playing, and stage theatrics that came to be the foundation of what is available today.